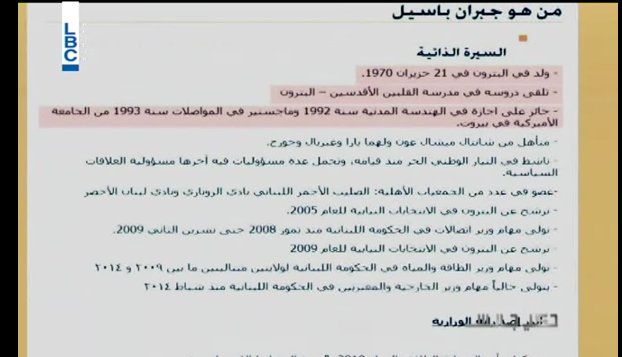 Home Rule of Law How did Minister Bassil acquire $22M of real estate? Lebanese broadcaster LBC has just released a fascinating report detailing the curious and multi-million dollar real estate holdings of Lebanon’s foreign minister, Gebran Bassil. 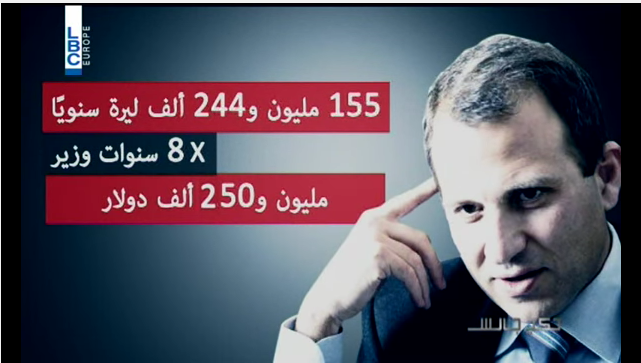 Finally, LBC points out that Bassil’s official government salary for being minister over the last eight years accounts for $1.25 million. According to LBC, on his personal webpage, Bassil describes himself as being born into a “middle class family”, graduated from college in 1993 and began “working on small projects” before he met General Aoun’s daughter. 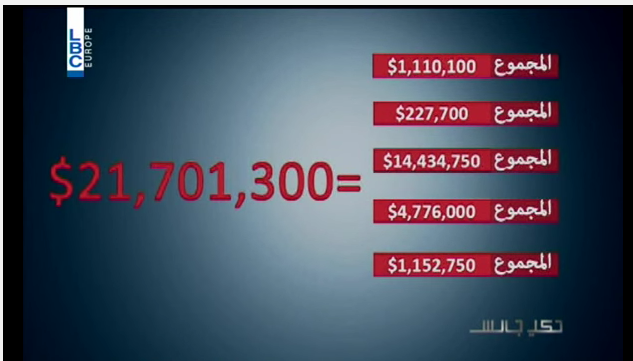 The LBC voiceover asks: “How did he acquire so much property? Does he have other sources of revenue? 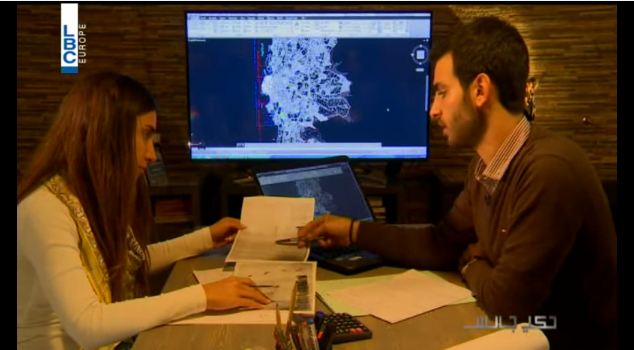 The episode ends as host Joe Maalouf notes that the property values are estimations and may not be 100 percent accurate, particularly due to the common practice of undervaluing land purchases to escape taxes. (In fact, an official at the government’s real estate office once told me most properties are recorded at half of their actual values). Also the figures were reported during the first quarter of this year, so any acquisitions after that period are not included in the report. 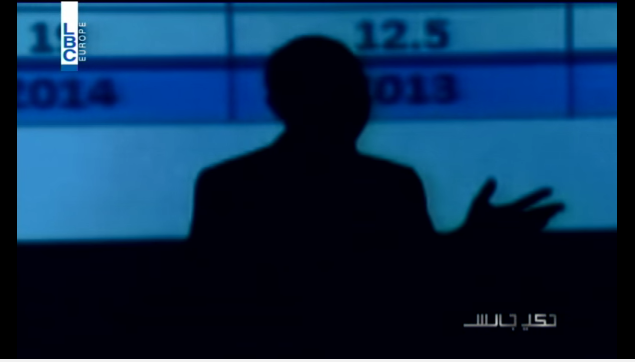 Maalouf promises to continue investigating the property assets of other politicians and he repeatedly states that this program is not an attack on Bassil or his political coalition. I think this would be a great journalistic initiative as there are politicians who have equally or much larger real estate assets than Bassil, including those of his political opponents. Earlier this year I wrote a major piece for The Guardian on how the Hariri family and its cronies– considered the political nemesis of the Aounists– have acquired beach front properties worth hundreds of millions of dollars through dubious manipulations of laws while disregarding the public’s right to access coastal areas. In the piece, I also linked to the impressive efforts of the activist group Mashaa which has revealed through Google Maps satellite images that senior politicians from all political parties have been illegally claiming the coast and establishing multi-million dollar resorts. I have also written extensively, most recently in an in-depth piece for Al Jazeera English about the major corporate deals that usurped most of downtown Beirut’s property from its original owners via Lebanon’s biggest company, Solidere, which is also closely tied to the Hariri dynasty and its many political associates and now worth over $9 billion. 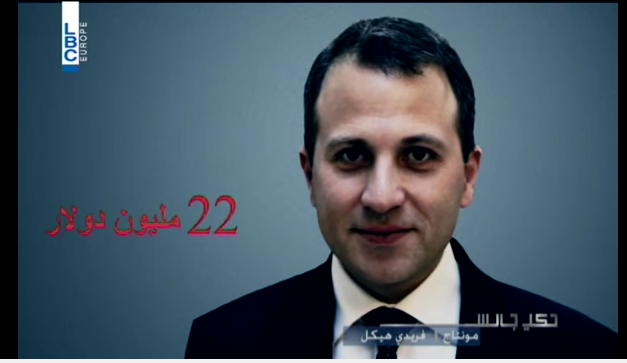 You can watch the full episode of “Heki Jalis” about Bassil below. Maalouf ends by saying he looks forward to hearing Bassil’s response. After years of propagandistic reporting, it’s encouraging to see some Lebanese news organizations begin confronting and investigating those who rule the country, often with the help of activists providing research and key documents. Let’s hope there are more investigations to come in real estate as well as other sectors. Thanks to Firas for sharing part of the report video on Facebook. Bassil also accuses LBC of potentially orchestrating an international conspiracy to defame his political party, due probably to what he described as their anti-corruption efforts and geopolitical defiance. He has also threatened to sue any further attempts at “character assassination.” You can watch part of his press conference here. Never in the history there was, there is or there will be a whistleblower than could shake the Lebanese political system. We embrace scandals as entertainment instead of sign of change.